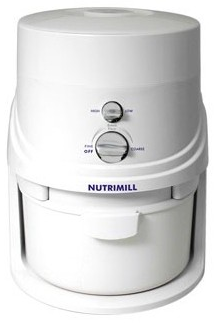 I’m not sure which to tell you about first: the Homemaking Ministries Online Conference I was invited to speak for, or the NutriMill Grain Mill you have a chance to win! Coming in just a few weeks, you’ll want to take part in the 2018 Homemaking Ministries Online Conference. I was honored with an invitation to be a speaker and have had so much fun preparing!! You’ll want to sign up to learn more about this conference here and when you do, you’ll be signed up to win some awesome homemaking prizes, including an actual Grain Mill!!! and many, many other kitchen, home, and Christ-focused topics. As for my topic, I get to share from my 21 years of experience teaching my kids to cook. It’s been a blast working on this, especially once I realized how much my kids’ ability to cook is such a blessed part of our family’s ministries. Who knew? More on that during the conference! So hurry over to sign up for the Homemaking Ministries Conference before July 9! I can’t wait to share more as the conference dates get closer. Kudos to my friend Kim (aka Garage Sale Queen) for providing all the wisdom for this post! Would life be simpler if this was gone? Is it more important to have a few dollars or cents in my hand or to still have this thing taking up space in my house? If you see an item and hear yourself saying, “Why do we still have this?” – put it in the garage sale pile. Wipe down everything that is dusty or dirty so they will look more appealing. Put jewelry and other small items in ziploc bags to keep them from getting lost and so you can put a price tag on them more easily. Group items in flat boxes so people can easily see what is inside. If people cannot find a price, they will often choose not to purchase. In addition, most people do not like to “make an offer.” We recommend putting a price tag on everything! Price items in 25 cent increments (eliminating the need for dimes, nickels, and pennies). 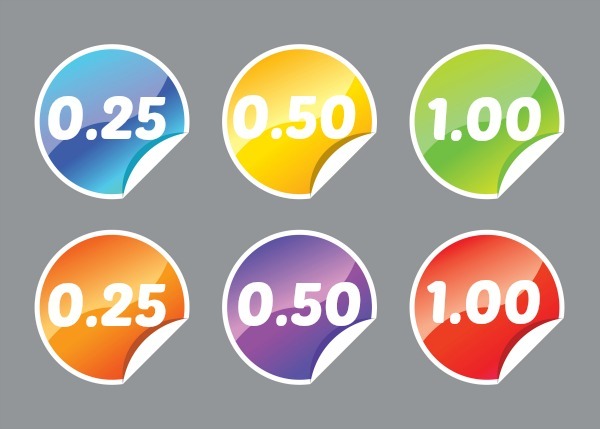 Use brightly colored stickers and large print to mark prices on each item. Be willing to negotiate your prices if someone offers you a lower price that is still reasonable. Highlight major items like furniture, bicycles, appliances, unique items, homeschool curriculum, antiques and name brand clothing. Think about what might make your garage sale stand out. Mention specific collectibles, children’s play equipment, tools, or outdoor furniture. If you are doing a multi-family sale, emphasize that. It makes people more likely to come because there will be more things to see in one location. If you are doing a moving sale and “everything must go”, say that because people know that you are more motivated to get rid of things. If you are selling off baby equipment, make sure you say that. New moms are always looking for great deals on baby equipment- Grandmas and child care providers, too! Include the specific dates and times you will hold your sale. Friday afternoon/evening and Saturday mornings tend to be the best times for most. If your address is one that is hard to find, include directions in the ad. This guy is incredibly excited to come to your sale after reading your ad. Free Advertising: Post your ad to your local Facebook Selling Page. Consider posting it on your personal page. A Note About Posting Online: People may ask about the prices of things and ask you to sell them “before” the sale, sometimes at a reduced price. While this can be nice, it can also make for some difficult situations, especially if you have already put that item in your newspaper ad. If someone came to your house specifically for that item at the beginning of your sale only to find that it is already sold, it can make for some not very nice exchanges. A bag, box, or drawer works nicely for your garage sale money. In advance of the sale, be sure to fill it so as to have change on hand for customers. It is best to begin with about $20 in ones, $20 in fives, $40 in tens, plus at least one roll of quarters for making change. Keep track of what you began with so you have a more accurate total of your sales at the end. Try to keep it organized throughout the sale. Keep ones together in front of fives, in front of tens, etc. If your bag is getting full during the sale, take some inside your house (especially the checks and larger bills) and put it in a safe place. 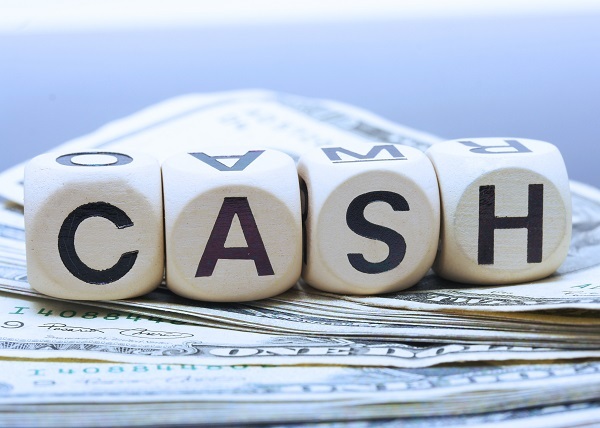 Decide ahead of time: Are you willing to take checks? If so, do you have requirements? For instance, check has to be local and include a usable telephone number. Most people are not set up to take credit or debit cards, but would you accept PayPal? This new way of paying is becoming more popular at garage sales, especially with the commonality of smart phones. 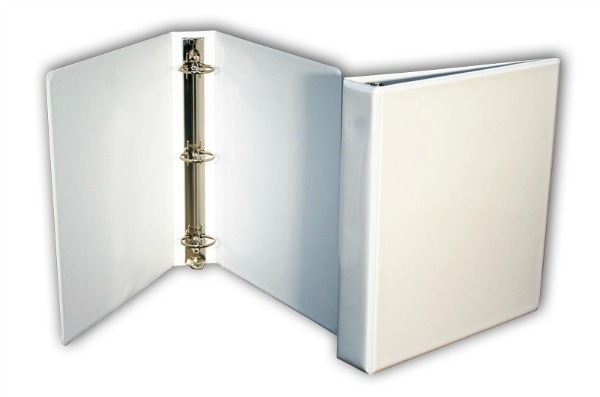 There are several items that are nice to have on hand before and during a garage or yard sale. You might need masking tape to write on, to tape up signs, to mark prices, to hold boxes together, and group items together. You might need scratch paper to make signs about prices, to write down additional information, etc. Sharpies, both small and large point, come in handy. Consider locating a tarps or two to cover sale items overnight. Measuring tape is nice to have to lend to customers interested in specific items. 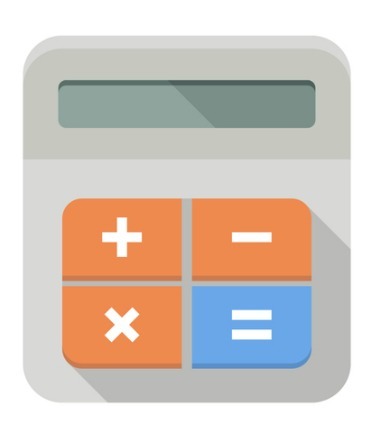 A calculator can come in handy unless you’re great at doing math in your head. Borrow and set up many tables to place sale items on. Tables are better than the grass or driveway in most cases because people don’t want to bend over. Make things easier for people to see and reach and you are more likely for them to sell. Group things in categories: kitchen, bath, kids toys, clothing, bedding, tools, books, curriculum, crafts, baby equipment, etc. Arrange furniture in nice groupings, if you can. Put the same size clothing and shoes together. Put bedding sizes together and mark them clearly. Have a free box. 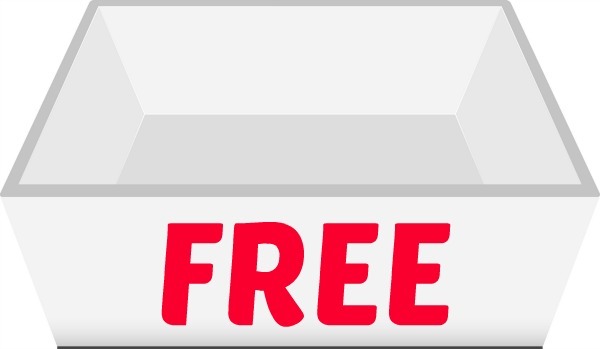 If you don’t know how to price it and you’d price it super cheap, put it in the free box and watch it leave! 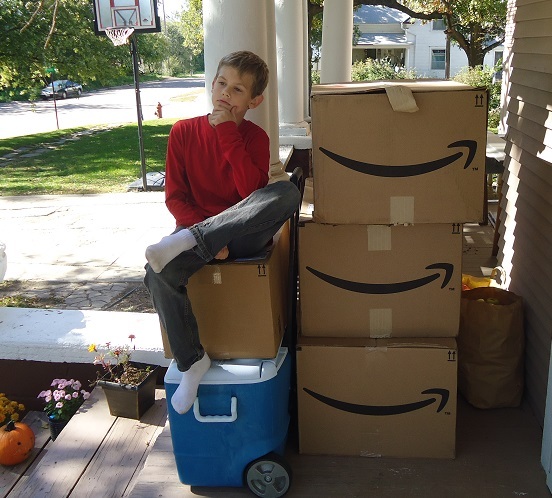 Make LARGE LOT deals: For example, “These books are 50 cents each or 12 for $5.” “This box of toys is $5 for the box.” “Clothing is “$1 each or 12 for $10.” It is amazing what people will take to make a great deal. The more they take, the less you have to deal with at the end. Set furniture close to the street so it will attract buyers to your sale. Stick with your planned start and end times. Ask for help. 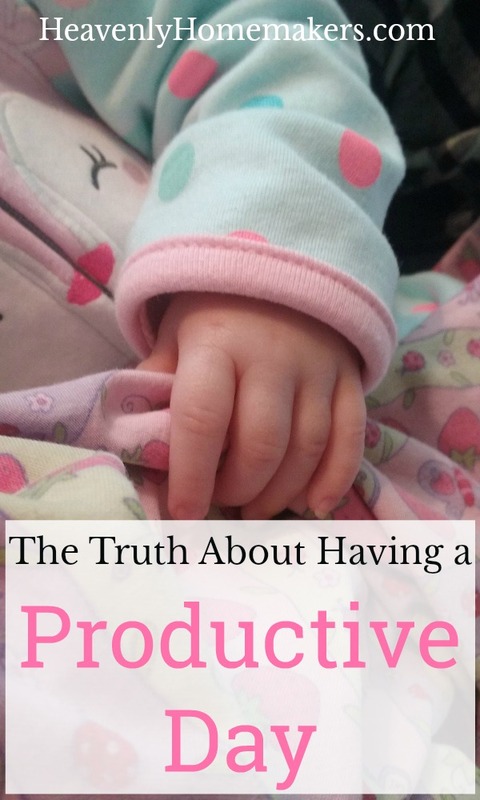 There are often times when you need two or more people to move a table, set up something quickly, get a drink, change the baby, or cover for you while you use the restroom. Be less willing to negotiate at the beginning of the sale and much more willing to negotiate toward the end of the sale. If someone wants an amazing deal (like less than half the requested price), tell them you will think about it and call them back later. Get their number and give them yours. If it doesn’t sell later, call them and work on the amazing deal. 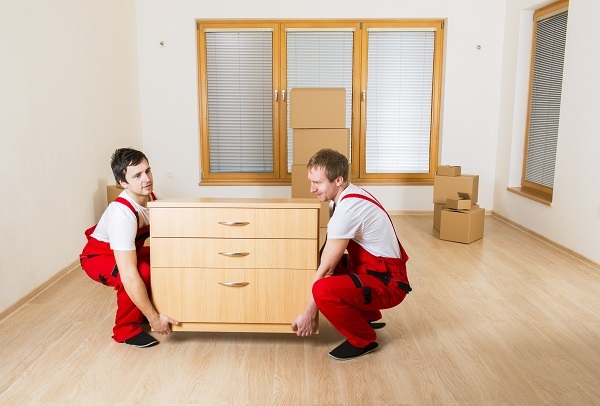 Obviously the people helping you move furniture will be dressed in matching red overalls. Larger sales are more likely to draw greater numbers of people. If you can plan a neighborhood sale or a multi-family sale, more people are likely to come. If your sale is a multi-family sale, in advance make a sheet that includes the names of all the people who contributed to the sale across the top. Then, add their sold item prices to the list so you can keep a running total of their sales. Or have each family’s price stickers of a different color or mark price stickers with initials. If you are not going to keep the money for yourself, but are raising money for a charity or event, let people know. People can be more generous when they know that their money is going to a good cause. Put it on the side of the road and offer it for free. It will likely disappear. Take it to a local thrift or charity store and get your tax receipt. That is not immediate money in your hand, but it might help with your taxes later on. Donate appropriate items to a local rescue mission or women’s shelter. List it online using a local buy, sell, trade page or your personal page. Use Craigslist or ebay, if you are savvy. Put an ad in your local newspaper. 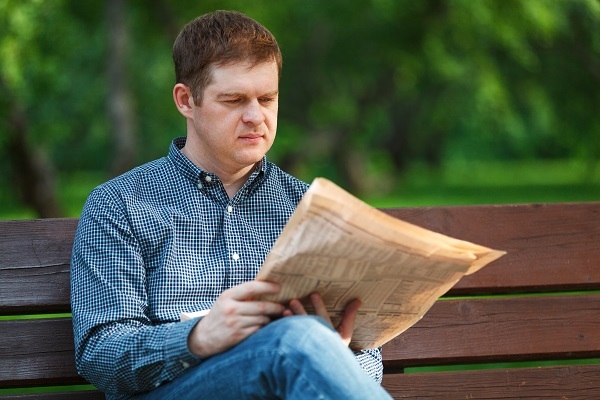 Some newspapers offer one free ad after your garage sale if you advertised with them. 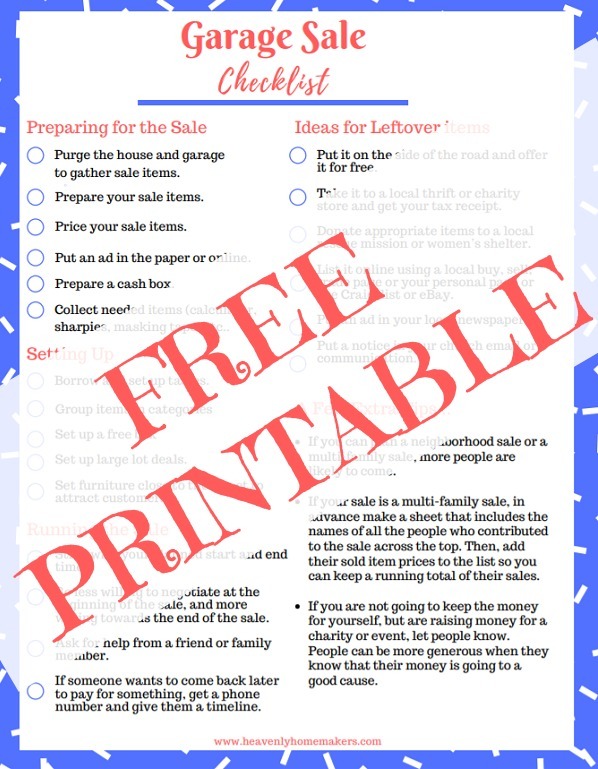 Get a FREE Garage Sale Checklist Printable. 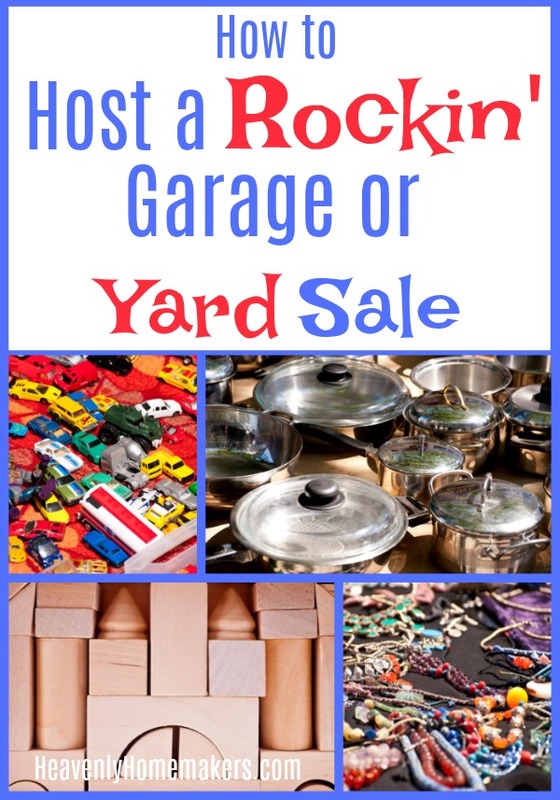 Use this handy checklist to help you have a super effective garage or yard sale! Get this free printable when you join our Heavenly Homemaker’s Savings Club. We love sharing great freebies, deals, and money saving tips with you! Simple Ingredients for Simple Meals Printable! Gift for You! After many a request, we’ve finally created a Simple Ingredients for Simple Meals printable list for you to work with. Just when you thought it wasn’t possible, simple cooking just got even easier! Over the past several months, many of you have requested that I create a list of all the ingredients I like to keep on hand to make real food cooking easier. It’s taken a while, but I called in for back up and had one of my assistants help create what I declare to be beautiful, practical, and of course, simple! The timing is perfect for this fun Simple Ingredients list to become available for you. Why? Because we just kicked out our High Five Recipes eBook, which shares 111 recipes that all include 5 or fewer simple ingredients. 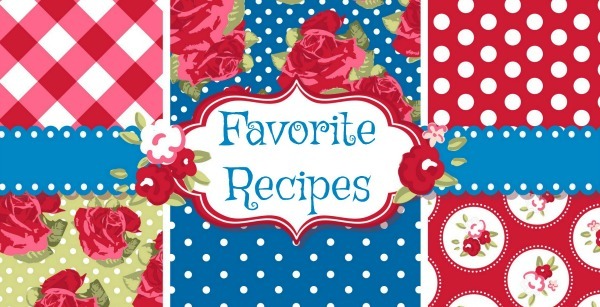 Wondering which ingredients can be mixed and matched to make all 111 of these recipes? This list pretty much covers it! And then some. Don’t you love how easy this printable breaks down that basics of ingredient needs? All the ingredients listed are real food, nourishing, and un-complicated. Simple, simple, simple! Yes, real food cooking is SIMPLE!!! And it tastes great. This, of course, is a must. Obviously we’re all going to have favorite items not listed here. But this is our go-to list for all Simple Ingredient needs for Simple Meal preparation. Add to it as needed for your family! It’s our pleasure to give you this Simple Ingredients for Simple Meals printable list as a gift. We hope it is a huge help in simplifying your real food cooking lifestyle. 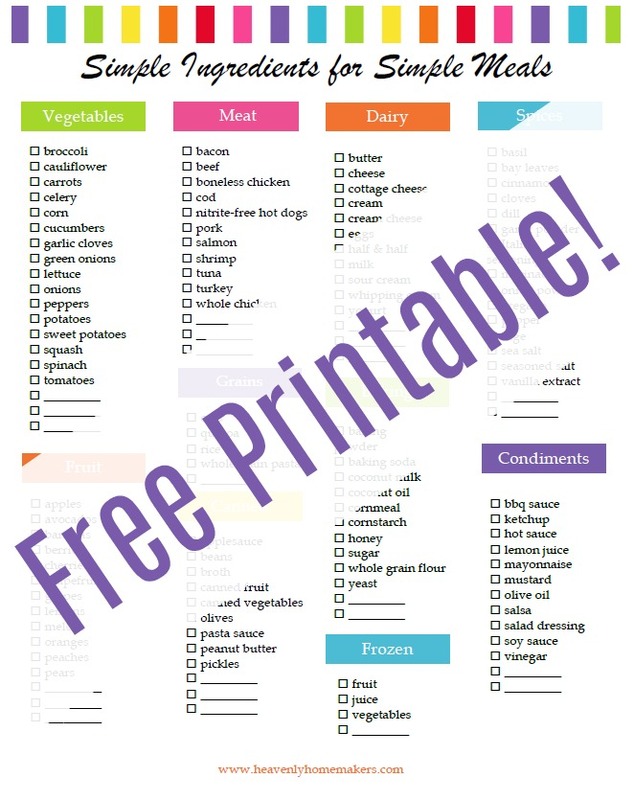 Use it as a guide so that grocery shopping will be simpler, so you can save money, and so you’ll be able to have basic ingredients on hand for creating Simple Meals. As with any holiday, I like to actually enjoy myself and my guests instead of spending hours in the kitchen. 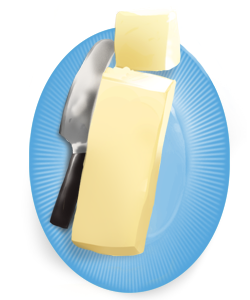 Thus, today I will share the easiest meal to make for Easter. 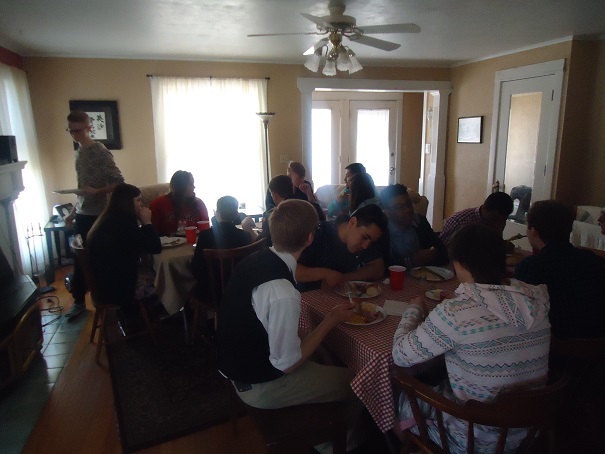 It has become our tradition to invite a houseful of college students over to enjoy our Easter dinner with us. It is worth noting that young adults are most certainly not too old to enjoy plastic eggs filled with bunny-shaped sugar. 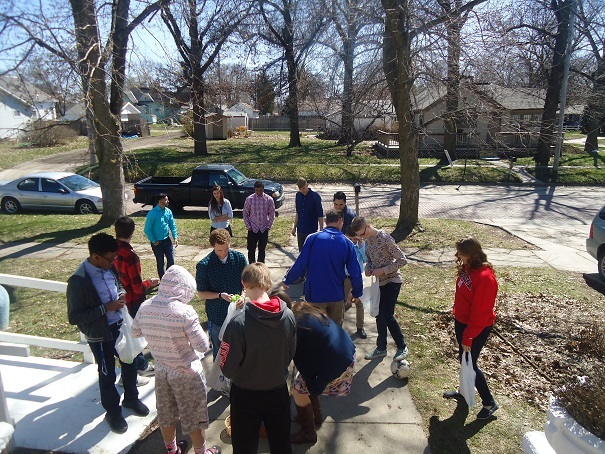 We fill eggs with candy, then half of our guests hide the eggs all over our yard, hoping to challenge their fellow college students to climb into precarious places to find said eggs. We dig out plastic grocery sacks for everyone to use as Easter baskets because at our house, we like to be fancy. The meal I serve? Well, college kids love any form of home-cooking, thus they tend to not care what I make, as long as I’ve made it. It is a good thing that simple food just so happens to also be delicious. Love makes food taste better. Praying over my guests while I’m preparing the food has become my favorite hospitality practice. This takes away all the stress over the meal as I know God is the One who makes the food and the fellowship sweet and memorable. 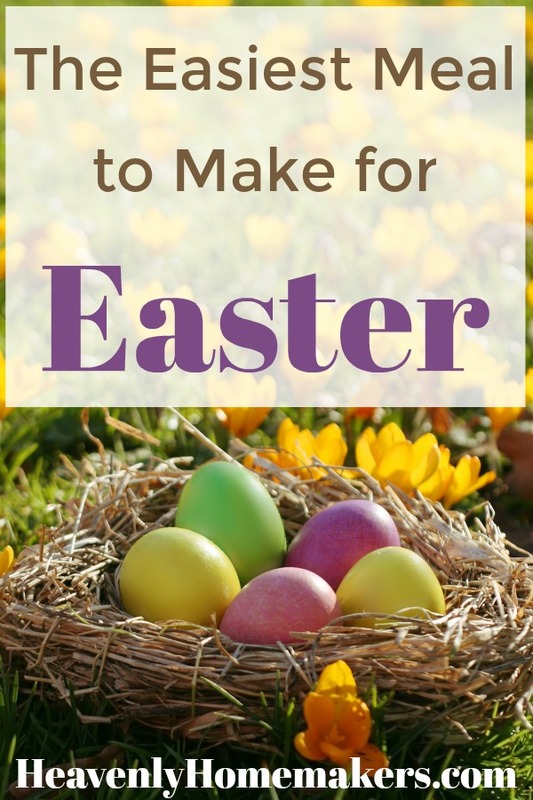 I’ve found that the easiest meal to make for Easter includes ham, potato casserole, veggies, rolls, and a simple dessert. Nothing fancy necessary, except for the above mentioned plastic grocery bags we use as Easter Baskets. Those always wow our guests. 1. I buy a Spiral Sliced Ham. 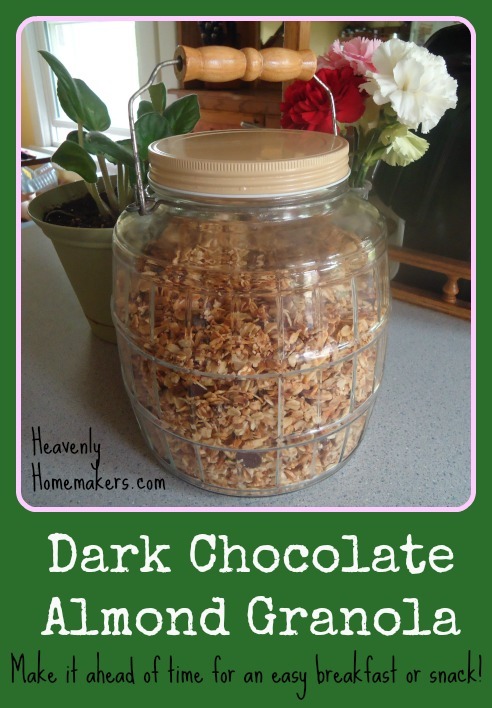 These taste incredible and are super simple to make. I plop it in a pan, throw away the packet of glaze, cover the ham, and bake it while we are at church. Just before serving we cut it off the bone and put it on our buffet. It is a hit every time and it takes no work to prepare. 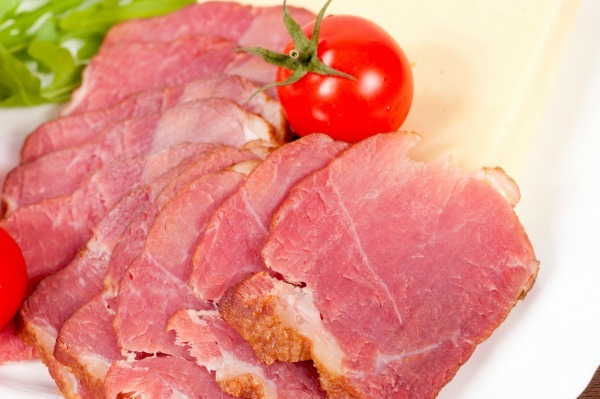 Spiral sliced ham for the win! 2. 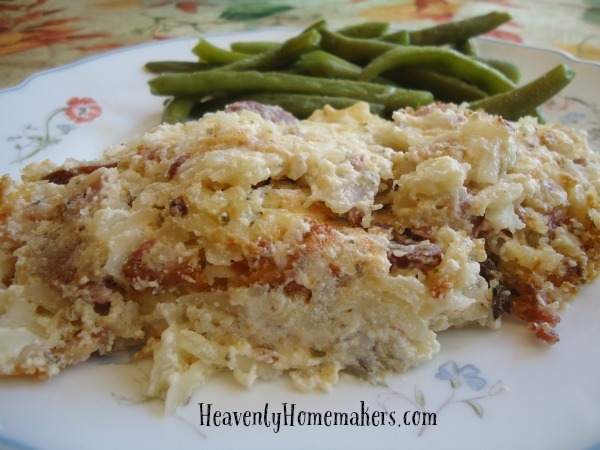 I make a Cheesy Hashbrown Casserole ahead of time. Then I slide it into the oven along with the ham to bake while we are at church. This is multi-tasking at its finest. 3. I quickly make some veggies and/or a salad. Steamed green beans, Honey Glazed Carrots, a tray of raw veggies – none of these takes much time or effort to prepare. 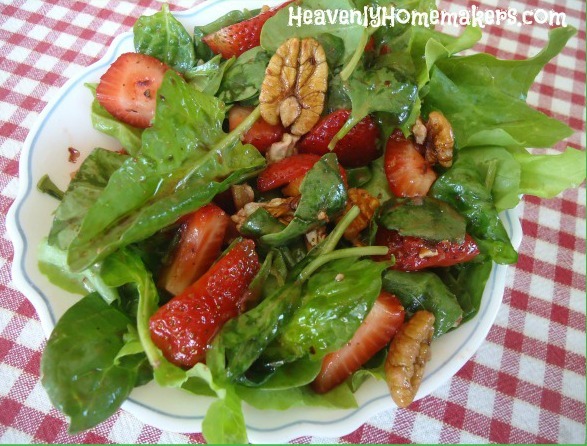 If I have time, I might put together a “fancy” salad like this Strawberry Spinach Salad. I never thought I’d see the day, but I’ve learned that relationships and hospitality can look like homemade rolls AND store-bought rolls. For this season in my life, I have decided to buy rolls, plop them in a basket, and go love on the people. Maybe eventually I’ll get back to making homemade rolls, seeing as they are hard to beat! Sometimes I skip making dessert altogether and simply sprinkle Easter candy across the middles of the tables. 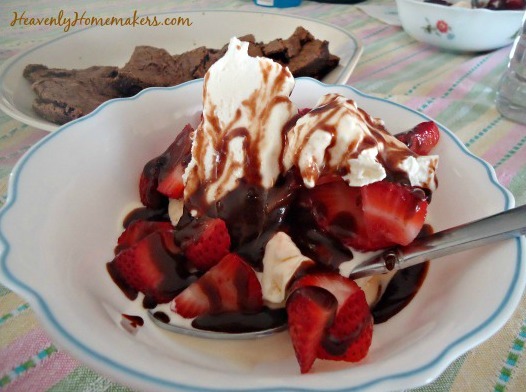 If I have time to do more, I bake brownies, buy ice cream, and set up a Brownie Sundae Bar. 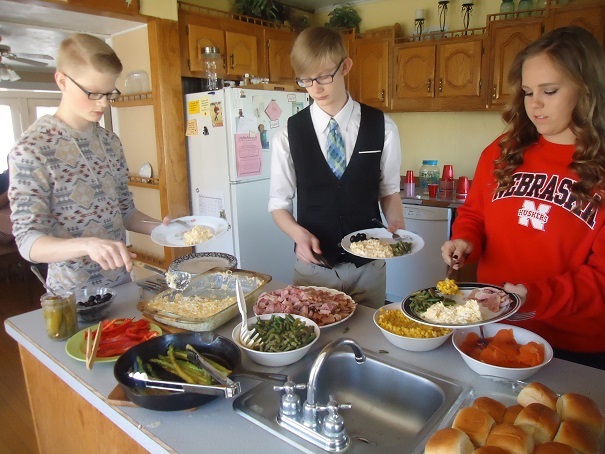 This Easter meal is simple but fabulous, our tables are filled with people we love, and I guess it goes without saying that hiding/hunting Easter eggs with college students who are walking around holding fancy grocery bags provides enough fun to last us all year round. This Real Food Cheat Trick is going to sound fairly lame. I admit it. But this tip saves me oodles of time without costing much, if any, extra money! This is how I save time chopping onions! How’s this for a tip? 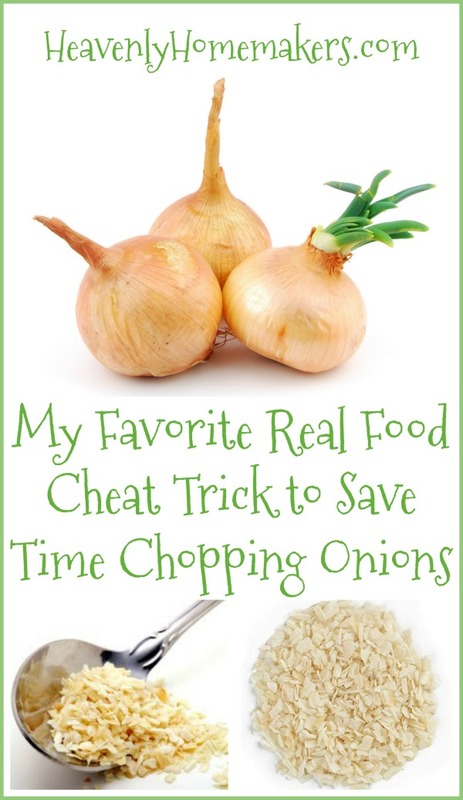 Want to save time chopping onions? Don’t chop them. Hold your applause. Please stay tuned for more brilliant tips like this one. Now that I’ve fully prepared you to be unimpressed, I will admit that it’s likely that many of you will thoroughly dislike my trick. Why? Because most certainly the smell of freshly chopped onions and minced garlic sauteing in a pan with olive oil or butter is incredible! You are right and I agree. But I still like my trick and I love the time this saves. I always keep a huge supply of Dried Minced Onion on hand. I almost never go to the trouble of chopping an onion. I simply grab my jar of dried minced onion, dump in the desired amount, and stir it into the meat I’m cooking. It still smells amazing. It flavors the food marvelously. And I save myself the trouble of chopping an onion, crying a river, and cleaning up the mess afterward. Also, for people who don’t love chunks of onion in their food, but do love the flavor onions give, using Dried Minced Onion is a great solution! I might as well make a garlic confession while I’m here. I frequently cheat with that too. True story: I almost never buy fresh garlic, a fact of which has many of you throwing tomatoes. Fresh garlic is tough to beat, no doubt. But time saved in the kitchen trumps all, in my book. 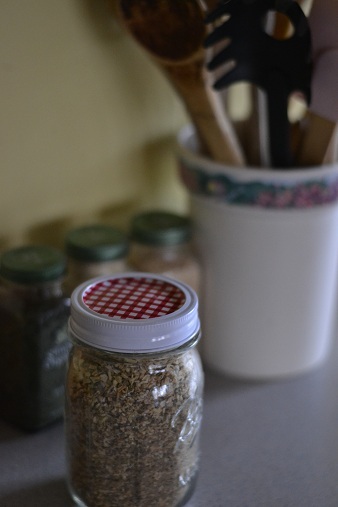 So I either keep a jar of minced garlic in the fridge or I grab my jar of dried garlic powder from my spice cabinet. My food still tastes delicious, but I’ve saved myself some work by using these convenience items. But doesn’t this cost more? Minced Onion appears to be more expensive per pound compared to cost per pound of fresh onions. However, Dried Minced Onions have been dehydrated, shrinking them down and changing their weight. You’ll get a lot of dried minced onion per pound compared to fresh onions. 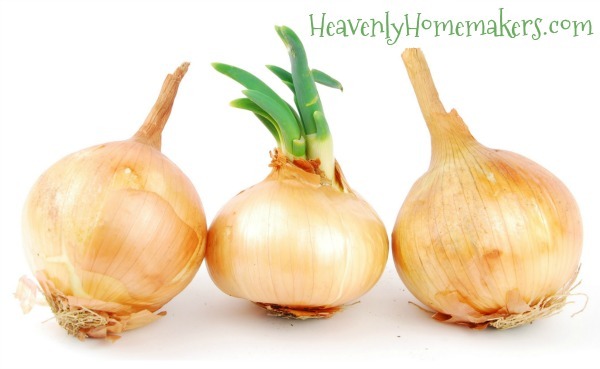 One small fresh onion equals 1 Tablespoon Dried Minced Onion. Most grocery stores carry these. They can be found in the aisle with the spices. However, I typically purchase it in bulk either from Azure Standard or Amazon. Now it’s your turn to tell me if you feel it is worth taking the extra time to chop onions and garlic. If you’re often feeling tight on time in the kitchen, I recommend giving this a try, especially on busy days! Do you have stinky shoes at your house? If so, today I shall become your new best friend as I reveal my fabulous (but weird) secret to getting the stink out of shoes. You can be very sure that my methods work as I am, most definitely, an expert on shoe stink. Is my profound wisdom on the matter a result of time spent doing extensive research on the subject? No. In fact, my expertise comes from living with five male, adult-sized athletes. We have four pairs of basketball shoes plus ten pairs of soccer shoes (because, of course, they all need both indoor and outdoor varieties). The stink here is real, folks. Anyone who opens our front closet does so at their own risk, as the stench of 28 athletic shoes rises up inside in a thick, green cloud that makes a person wonder if a dead animal lies therein. We tried airing the shoes outside, stuffing newspaper inside them to draw out the smell, and used multiple commercial products that promise great results. And yet, the stink remained. The tears rolled down our faces. We thought we might have to move out of our house, but of course, the shoes would move with us, so then what would we do? See? I told you we tried the “stuff newspapers inside” method. Not to worry. 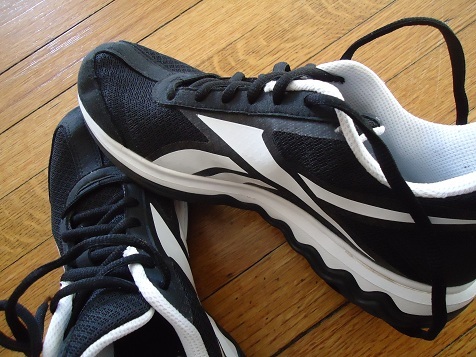 There’s a simple remedy for shoe stink and you are about to be amazed! I should warn you that as excited as I am that my shoe stink removal methods work so fabulously, my grandma would likely shake her head in dismay were she alive to read this article. “Surely there is another way, Laura,” she might say. But I would say no. I’ve tried all the other ways and nothing else works as well as this. So ladies and gentlemen, I’m afraid it’s time to buy some vodka. Yes, this is what it’s come down to. Vodka just so happens to be a magic ingredient in Grandma’s baking vanilla extract, a fact of which I’m sure she was blissfully unaware. And, as my husband and I have recently discovered, it also works fabulously, mixed with tea tree oil, at immediately killing the stink in shoes. This fabulous discovery became known to us on a day we had finally had enough. The shoe stink has somehow risen to a new level. There were no words. My husband did a quick online search to find that simply spraying a mixture of vodka and tea tree oil into the offending shoes would immediately remove the stink. Could it be? Well, I always have a bottle of vodka on hand so that I can make batches of Homemade Vanilla. So we quickly got out our vanilla-making vodka and poured it into a spray bottle. We added some tea tree oil from our collection of essential oils. We sprayed the mixture into a pair of shoes. Miracle of miracles. The shoes immediately smelled fresh. I’m talking, you can put your face right down into the shoe, live to tell about it, and even come up smiling. I double dog dare you to try this amazing concoction. Spray it into your most offensive shoes. Put your face into the shoe. Be filled with joy. Now this spray is not a one-and-done stink removal remedy. We’ve found that we must spray our shoes down after every athletic event because while the DIY spray is powerful, so is fresh sweat. Good talk. Pour vodka into a spray bottle. Drop tea tree oil into the bottle and shake to mix. 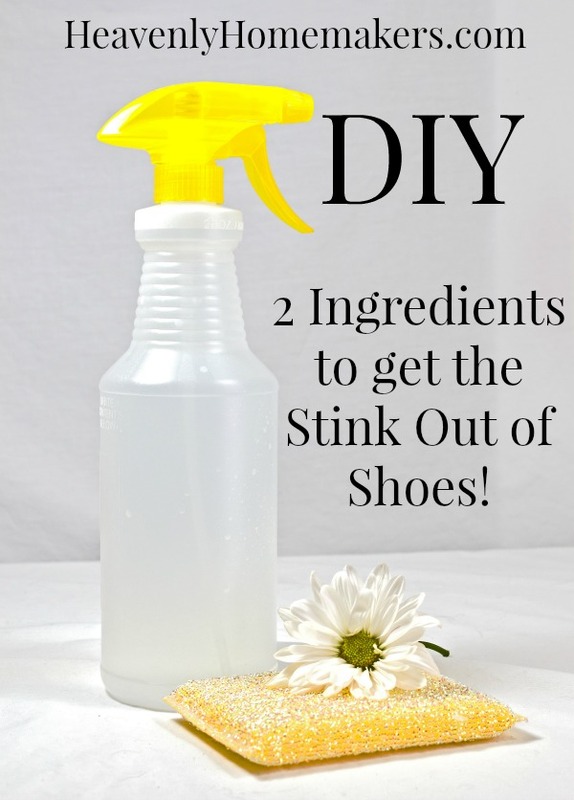 Spray mixture into stinky shoes and be amazed! I couldn’t have done it without you. I asked what YOUR best real food money saving tips might be, and oh did you come through! It was so fun to put all of our heads together and put together this great (FREE!) 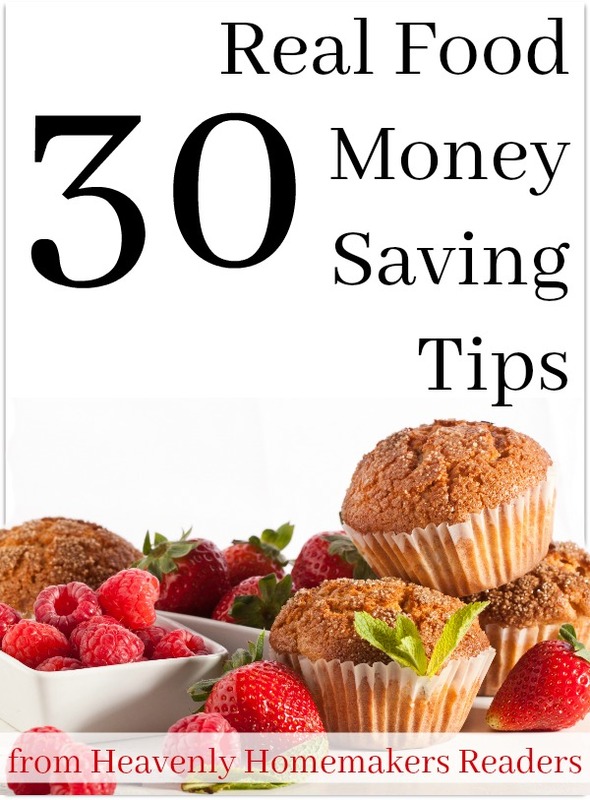 resource full of Real Food Money Saving Tips! 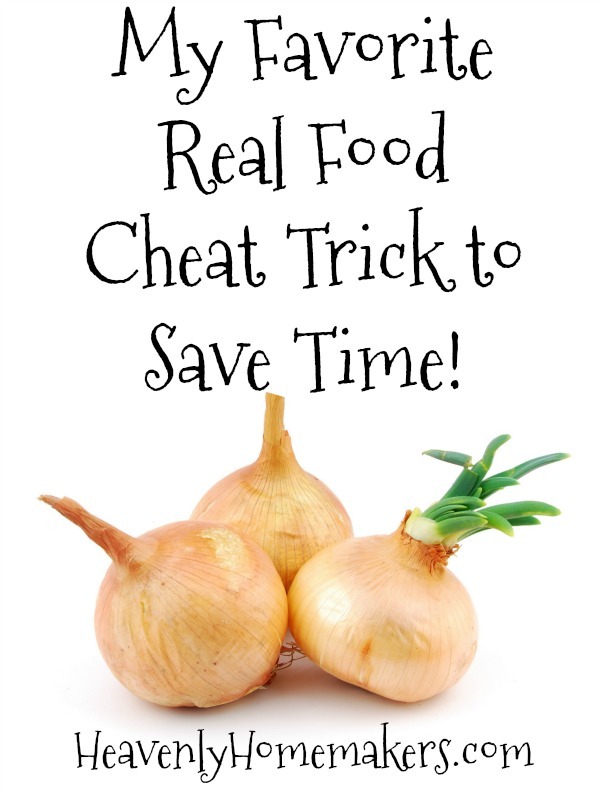 There truly are many great ways to save money on real food groceries! I love it when high quality meat is marked down! Crystal: I only have a family of 3, but because of prices of grass fed beef and organic chicken, I only use half a pound when I make spaghetti or a casserole and I use 1 chicken breast when I make a noodle dish or casserole that calls for chicken. I’m always using less meat than called for as a way to stretch it. That way I can afford higher quality meat. It works for us! Nicole: Last year I switched around how I menu planned instead of finding recipes then going shopping for those ingredients I now hit the produce & meat area buying what’s on sale (and good quality!) then I come home and find recipes that contain those items. Now I don’t feel obligated to buy the higher non sale item because of the time I already have invested in menu planning. Melody: We have meatless Mondays, tuna recipes for Tuesdays, and I “shop” my pantry and fridge/freezer first, then the on-line ads, and make my menu plan from that. I make out my grocery list for just the items I will need to make the items on my menu. We also use less meat than a recipe calls for and add beans to stretch out the meat in meals like tacos or casseroles. Susan: My best money saving advice is the skip fancy recipes that require you to buy ingredients you don’t have on hand or use often. I often leave out or substitute a fancy ingredient for a more economical or practical ingredient. I can’t be a 5 star cook on my budget and some days I wish I had fresh herbs or a fancy vinegar, but running out to buy them for 1 recipe isn’t the best use of my funds. 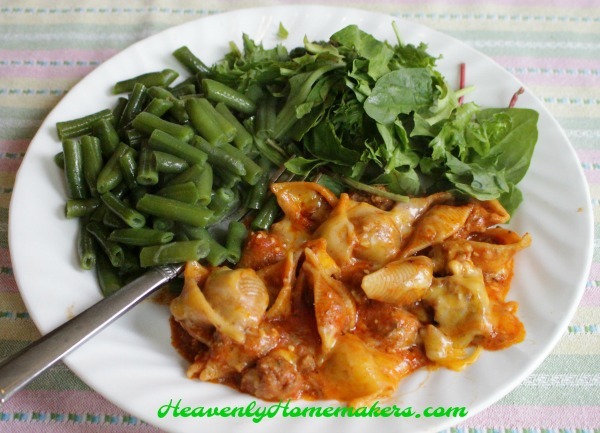 I have been sticking to simple real food recipes with basic cost effective ingredients. I make menus based on my own pantry and sale items. Also, I use leftovers for casseroles or soups (freezing them if I am not using them right away). Leftover or stale bread is used to make croutons. Christy: Twice a year we clean out the pantry and freezer. We buy only milk, eggs and bread until we are down to almost nothing in the pantry. 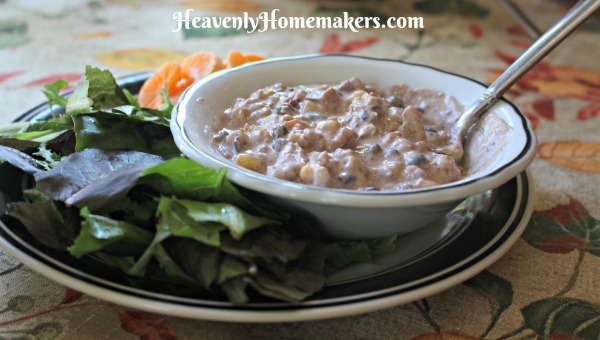 The meals get interesting, but it is great for the budget and can be as healthy as what you originally put in there. Mary Beth E: Right now–and tomorrow– I am waiting for UPS and/or FedEx to drop off packages of grocery staple items I buy in bulk. Because I cook whole foods at home, this will cover all our bread, rolls, tortillas, rice, pies, cakes, spices, seasonings, and much more, even toilet paper. I will place another order about mid-year. 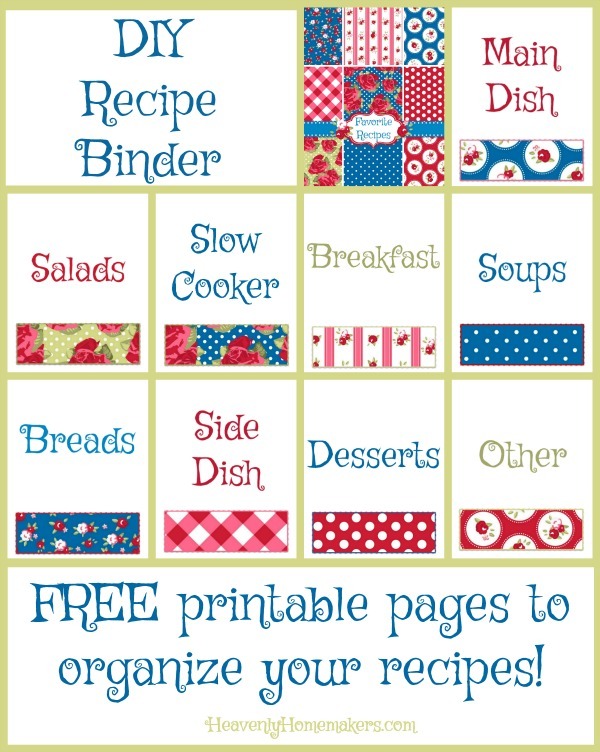 When I see almost any recipe, I have on hand the basics. 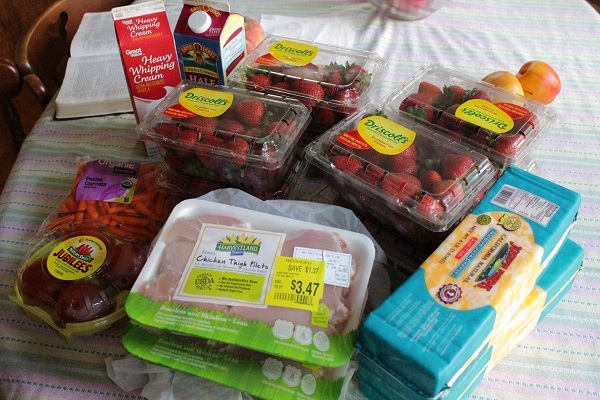 When I go to the grocery store–every other week–I mainly buy fresh or frozen produce, eggs, and dairy. Buying in bulk and thinking of your budget in terms of a year rather than a week, really saves a lot of money. Birdie: Garden and can, however you are able. A small plot in your yard, partner with others on a shared plots, help a neighbor with a plot, encourage your apartment/duplex owner to allow some of you to garden in the yard (check bylaws), talk to the college in your area to see if they would be interested in allowing community gardens. Even create a raised bed so you can sit and garden from a chair or wheel chair if you are not as mobile. Container garden on a balcony or deck (remember to water often). 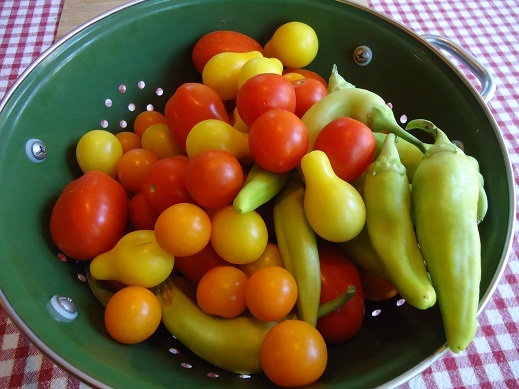 If you can’t garden, buy meat, fruits and vegetables in super sales, can, freeze, and dehydrate. Approach a few farmers and see if you can have shares in their live stock. Participate in butcher time and you may receive a great deal on meat. If you can get your hands on garden herbs and spices from others, dry and add lots of flavor to your cooking. Nedrda: One way I save money on quality meat is to partner with my sister and mom to buy a grass-fed/pasture raised cow or hog. We can buy those meats at $4.00 a pound and then split the meat between the three of us. 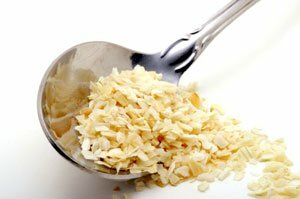 We also do this for the bulk coconut oil through Tropical Traditions and other items through Azure Standard and Amazon. By doing this, I do not have to come up with total amount myself to buy the beef/pork/oil and I can enjoy the quality for a great price. It also helps with storage issues to split the order! Crissi: For most of our grains, frozen fruits, some fresh fruits, and odds and ends we use Azure Standard. We’ve purchased foods from them for well over a year now, I’d highly recommend them. They have excellent customer service. Cassondra: One thing I do when I run out of something like a spice or condiment or anything else is look online to see if I can make it from scratch with items here at home. For example, I make our taco seasoning but was out of chili powder…so I went online and found a recipe for chili powder, had all the ingredients for it and it turned out great. So now I have one more from scratch recipe on hand. 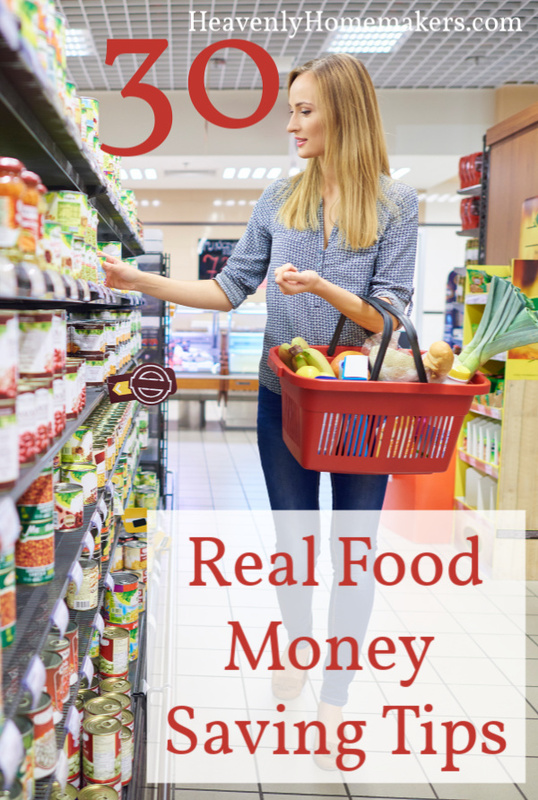 Want to read all 30 Real Food Money Saving Tips? We’ve compiled them all into this simple-to-read FREE eBook! 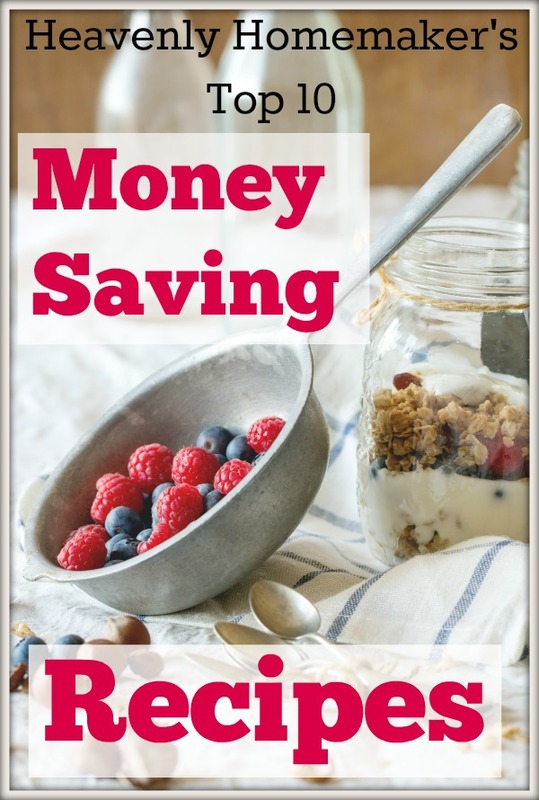 This great little book is full of tips I compiled when I asked you, “What are your best tips for saving money on real food?” Since we’ve been talking about Simple Meals on a Simple Budget this month, I thought it would be fun to remind you about this great free download. I truly loved compiling these tips and learned great new ideas to try as I work to save money while feeding my family well! Enter your email address here, confirm that you would like to receive this information, and the freebie will land in your inbox! Easy as that! Want a sneak peek inside the 10 Money Saving Recipes eBook?? Here’s one of our favorites! Saving money is fun when there’s chocolate involved. I can’t wait for you to enjoy all of the money saving tips and recipes! Sign up here and watch for these great free eBooks to hit your inbox! P.S. Signing up for these great freebies will connect you to our free Savings Club so we can occasionally let you know of other wonderful food and homemaking deals we learn about! With the High Price of Vanilla Beans, Should You Make Homemade Vanilla Right Now? I’ve been making Homemade Vanilla since 2009. Why? The price of vanilla beans has risen drastically. 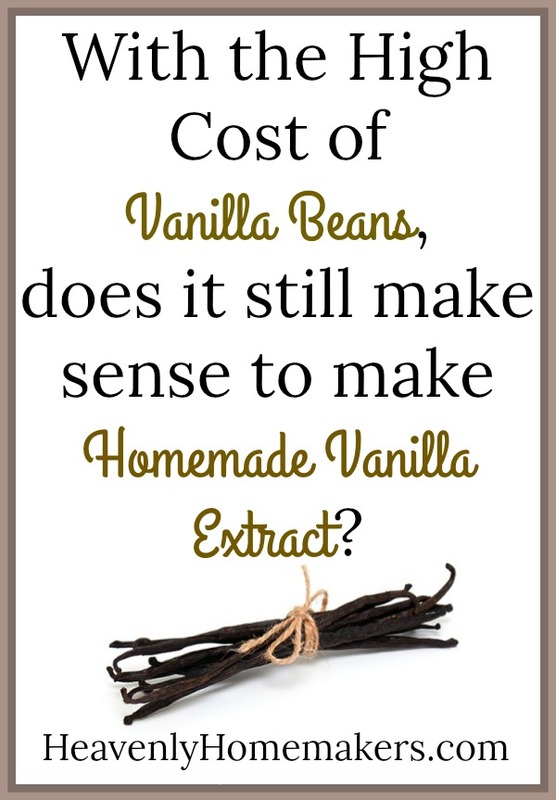 In the past three years, the price of vanilla beans has gotten crazy high! Making Homemade Vanilla used to be super cost effective, saving oodles of money compared to buying it. Since there are so many other benefits to making it, it became a no-brainer to me! Does it still save money to make Homemade Vanilla? Having said all of this, I wanted to share that I recently crunched some numbers again to see if it even made sense to make a batch of homemade vanilla right now. I was pleasantly surprised, and want to share my findings with you! The upfront cost still seems high, but read all the way through to discover how to get the most bang for your buck. This makes an 8-ounce bottle cost $14.40. Remember, the quality of vanilla is ultra strong, not watered down, with no added sugar. Imitation Vanilla is made of nothing real, so I recommend avoiding it even though it’s cheap. The best pre-made “pure” Vanilla Extract I could find at Azure Standard costs $2.20/ounce. Not only is purchased vanilla extract more expensive, it is watered down, so not nearly as strong. So Homemade Vanilla Extract wins the prize for being lower in cost and entirely pure. Use Half the Amount and Cut the Cost in Half! Because the Homemade Vanilla Extract is so very potent, I recommend that you use half the amount called for in a recipe. Doing this will double how long an 8-ounce bottle will last! And with that, I absolutely recommend that we all still make Homemade Vanilla Extract! I forgot we get 20% off!!! 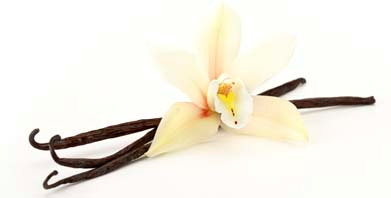 Get the best quality vanilla beans at the best price here. Use the code home to get 20% off, a code made exclusively for Heavenly Homemakers readers! Get free shipping when your order is over $50. One last note! 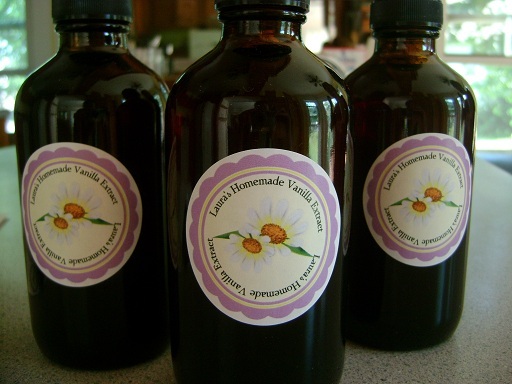 Most everyone loves receiving Homemade Vanilla Extract as a Christmas gift! 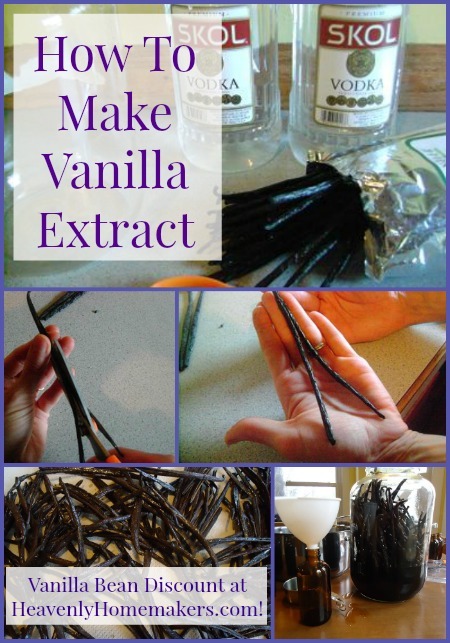 Because it takes 4-6 months for vanilla beans to “extract” I recommend you start a batch right away to have it ready to give in December. I think that about covers it. Any questions? (I’m actually at church camp right now so answers will probably be delayed!) I’m so glad I finally crunched the numbers instead of continuing to cringe over the bean prices!